ONE: Republican Dark Money Groups are infiltrating and corrupting our Democracy to its very core. They influence policies to benefit ultra-wealthy political donors, not everyday Americans like you. TWO: These Far-Right groups are likely planning to pollute our Democracy with HUNDREDS OF MILLIONS of dollars to Re-Elect Donald Trump in 2O2O! 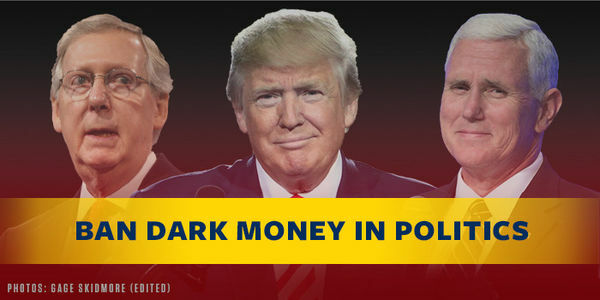 THREE: We must fight back and DEMAND an end to Dark Money or Trump could be Re-Elected! So we&apos;re ready to fire up our engines and mobilize our Grassroots network (over 4,000,000+ strong!) to destroy these vile groups and give power back to the people. But we need your help to save Democracy from these corrupt Big Money Interests. Sign the petition immediately to join the movement to Ban Dark Money.